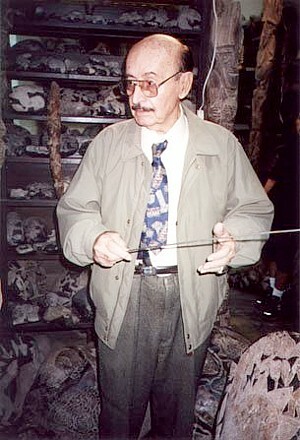 Large numbers of incised stones were collected by Dr Javier Cabrera Darquea (1924-2001) in the village of Ica, around 300 km northwest of Lima, Perú. His first stone was given to him by a local farmer as a birthday present in 1966. He subsequently amassed around 20,000 individual stones, ranging in size from a few centimetres to over half a metre, that are now displayed in the Museo de Piedras Grabadas (Museum of Engraved Stones) in Ica. What piqued his interest was that the first stone he was given depicted what he identified as an extinct species of fish. After talking with the locals, he claimed to have discovered many more stones hidden in a cave near the coastal mountains, where there are at least 100,000 more that he had not removed. He never revealed the location of the cave to archaeologists who might assess this cache of stones in situ. Having made his discovery, the Doctor gave up his medical practice in Lima and opened his private museum, dedicated to portraying the earliest culture of Perú as a technologically advanced civilisation deriving ultimately from a planet in the Pleiades a million years ago. The Pleiades have become a favourite location for the origins of messages ‘channelled’ to New Age practitioners. Quite how the million-year-old chronology permits the depiction of dinosaurs, which were extinct at least sixty million years earlier, is not explained. Most of the stones are fist-sized pebbles of grey andesite, with a granitic semi-crystalline matrix. It is a hard stone that is difficult to carve, but the images are scratched through the oxidised surfaces. Engraved stones were first recorded in the region by a Jesuit missionary Padre Simón, who accompanied Pizarro to Perú in 1525 and examples were sent to Spain in 1562. The engravings collected by Cabrera show allegedly very surprising images, with medical procedures, the use of telescopes and, most surprisingly of all, humans interacting with dinosaurs, including brontosaurs, stegosaurs, tyrannosaurs and pterodactyls. Unfortunately, the images are all highly stylised and it is curious that Dr Cabrera never indicated what features of the fish on the first stone he was given led him to believe that it is an extinct species, or, indeed, what that species might be and when it became extinct. The farmer who gave Cabrera his first stone was subsequently arrested for selling the stones to tourists. In his defence, he said that he had not in fact found them in a cave, as he had told Dr Cabrera, but made them himself. Other local people continue to make these engraved stones. They are selling forged hoaxes – a Bad Archaeology double whammy! However, Cabrera countered this claim with the sheer numbers of stones. As well as the 20,000 or so in his collection and those sold to tourists, he said that locals have found about 50,000, while the cave contains another 100,000. This is too great a number to be the effort of a single poor farmer with little spare time to create so many hoaxes. Nevertheless, he maintained that he carved at least some of them. Neither he nor Dr Cabrera revealed the location of the cave that is supposed to contain the huge cache of stones. Riding a pteranodon in ancient Perú? It is possible that some of the stones are genuine examples of pre-Columbian Peruvian art, but at least some are forgeries. 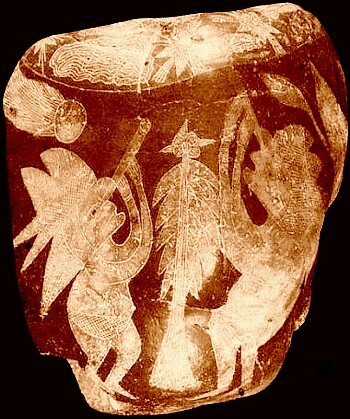 Many of the allegedly anomalous images are so highly stylised that it is difficult to see exactly what is being depicted. Some are so plainly bizarre that they can be discounted, as in the example showing a human riding on the shoulders of a pteranodon, a species of pterosaur that (should the bizarre act ever have occurred) could never have supported such a weight. Those that show dinosaurs, especially, show them as reconstructions popular in the early to mid twentieth century did: as lumbering beasts, dragging their tails along the ground. We now know that this was not how they walked, a clear demonstration (as if any were needed) that the stones are a twentieth-century product and not the creations of people who saw living dinosaurs. Me llamo Ernesto Cabrera Claux y soy el director del Museo Cabrera, que lástima, usted ha consignado datos en este articulo que no se ajustan a la verdad y en otros usted MIENTE, se nota que usted no ha investigado nada del tema y que su soberbia no lo deja ver, el tiempo y la razón le van a hacer rectificar este artículo, no lo va a hacer porque crea en las teorías de mi padre, sino porque va a tener miedo de pasar a la historia como un gran ignorante. Está usted cordialmente invitado a nuestro Museo para que tenga los conocimientos adecuados y no haga este vergonzoso papel de ignorante, vamos a esperarlo y sino viene a hablar con nosotros, vamos a proceder a iniciar la acción legal contra usted por su ignorancia y por sus mentiras. This appears to be a threat of legal action by the director of the Museo Cabrera for lying about the exhibits (my knowledge of Spanish is very limited!). Needless to say, the criticisms presented here are not actionable under any law currently or formerly in force in the UK. If one has to resort to legal threats to silence critics, it’s a sure sign that the evidence is not up to criticism. NO ES AMENAZA ES UNA LLAMADA DE ATENCION A SU IGNORANCIA Y A SUS MENTIRAS, QUE ESTAMOS ANALIZANDO COMO DEMANDAR. LAS CRITICAS SON ACEPTABLES LAS MENTIRAS SON SE TIENEN QUE DENUNCIAR. A little while ago, you threatened me with legal action about this page. You now resort to calling me a liar (and “shouting” at me in capital letters). If you have a valid criticism of what I have written here, please share it with me and other readers of this page. If there are factual errors, I will gladly correct them: after all, this site is all about looking at evidence and weighing different bits of evidence against each other to form valid conclusions. Simply asserting that something is or is not true is not my business. Any more comments of yours in this vein will simply be deleted. In other words, either put up or shut up. You are right. I will keep and publish any further comments Mr Cabrera makes, as they simply make him appear foolish. Sr. Don. Director jajajajaj Ernesto Cabrera jajajaja… la gente sólo opina y por lo menos se habla de las Piedras y del autor del libro de las Piedras, pero usted cómo hijo no ha hecho nada que sólo insultar asustar y hasta amenzar jajajaajj… valla “usted” cómo está hecho, cada vez que haga años estará peor si va así de primeras; seguro que le dará un ataque de corazón… usted no sabe cuánta gente opina de las piedras a favor y en contra y usted sólo amenaza y sólo queda bien diciendo que les invita cordialmente, que ya me han dicho que su carácter es muy malo, tan malo que va contra usted. Hay más piedras que ver y no sólo en el Museo, sino en Ocucaje y otros coleccionistas internacionales. Que sepa que se está tirando ladrillos a su tejado o otro dicho, que está meando es su propia puerta y luego dice que llueve. Aténgase a las consecuéncias de lo absurdo que se comporta y no sólo aquí en foros. jajajajj Intente leer http://www.piedrasdeica.es y puede que entienda algo más de lo que sólo está rozando. Es un gusto y enorme placer saber que siga el trabajo laborioso de su sr. padre. Que alegria me da que cuide de nuestra riqueza cultural. Siempre habra ignorantes envidiosos y ociosos que no mejor cosa que hacer. Nuestra historia es algo tan precioso y tan poco comprendido que no nos queda mas que cuidarla para las generaciones futuras. Siga adelante que el tiempo y la verdad siempre salen a la luz. Well, my Spanish is not that good so i put this in my translation site to try and make more sense out of it. All 3 translations were also nonsense. Did this poster write this in English 1st and put it through a translator? That could explain why mine is so garbled. As customary, foreigners have the audacity to be shamelessly uneducated. I am Peruvian and our history is so rich and vast that many mysteries still linger that not even a pseudo’aficionado white male from across the pond can answer. Why dont you enquire about the corruption in Your country and the all the stolen artifacts your government has manipulated. It is not coincidence Pirates emerged from your country, pillaging on the riches of other nations. Focus your time on your countrys business, instead of playing Indian Jones, as Peruvians we despise white foreigners like yourself pretending to know more about Our history, we will Not tolerate Intellectual Colonialism, if such can be called coming from you Mr. aficionado. Have a merry day, we dont need your input. This is not an issue of foreigners meddling in the affairs of Perú: I agree with you completely that the history of your country is rich and vast and that there is much still to discover. The colour of my skin and where I live has nothing whatsoever to do with my critique of Dr Cabrera’s stones: your attack on me is racist and uncalled for. If you truly value your country’s past and its antiquities, don’t be prepared to tolerate fraud simply because it is Peruvian! If these people can read this site, why can’t they post in English? And BTW- I looked at the stones at the referenced web-site. I guess I don’t have a great imagination since all I saw depicted were men, men fighting, fish, a llama, stars and moon and, oh, a cute sun motif of which I own several (in clay) bought at the local Mexican market. What’s interesting is there’s apparently a franchise of this crap with several sellers on the market, compiting between them. One would assume the original owner and “creator” of the franchise was the Cabrera guy who actually had the great idea of making some local indians to carve dinosaurs and sci-fi themes on stones. The fake precolumbian carved stones had been a typical item for tourist for decades on South America, a sort of “innocent” way for the local farmers to earn some money out of turism. Iguess then in 1966 the Cabrera dude had the “eureka!” idea. And his personal Mcdonalds was born. Surely the business was good for the Cabrera family (who soon turned high class society) as for the local indians who carved the products (who I highly doubt would get paid half the money his boss was receiving, but well, that was better than selling or 2 stones a year anyway). Also the town took advantage of the hype. With the boom of the “pseudoscience” and “conspiranoia” magazines of the 70s, this actually was a brilliant example of “the right idea at the right time” in the most pure capitalistic sense. Now today, as happens with everything, the idea spread and there’s many sellers of the product (understandable since the poor Cabrera couldn’t register the product as his, a victim of his own lie, LOL). The Cabrera guy did a great job. The dude managed to become a seller of “art” for fanciful, ignorant, ultra-rich collectors. The kind of people who buy art that it’s in vogue but has no criteria at all. Actors, blue blood people, millionaries… Cabrera made huge business. Now today the descendants are sort of triying to get some crumbles of it. The geographical statements here are somewhat off. Ica isn’t a village, it’s a city of some 244,000 people, and a regional capital. It’s southeast of Lima, not northwest. And the stones were discovered in the nearby Ica Valley, not in the city of Ica.